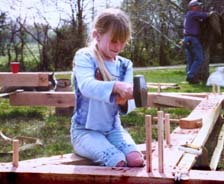 Detailed Building plans for Timber Frame Sawhorses. 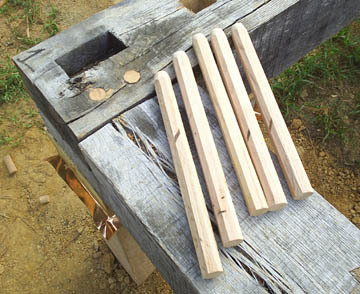 Plans include a materials list and detailed cut sheets for each timber piece. "Excellent plans! Quality design! Fast Shipping!" 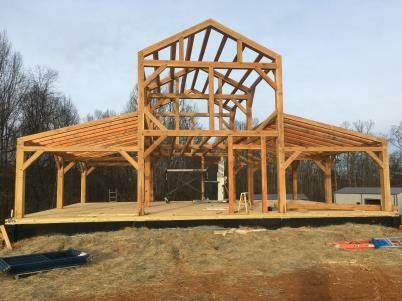 14' x 16' Queen Post Timber Frame with a full second story floor plan. These plans are perfect for building a small cabin. The frame has 420 sq. ft. of floor space and plenty of headroom on the second floor, The roof has a 9:12 pitch with common rafters on 32" centers. The door way is framed in on one side and wall girts are located at 4' and floor joists at 8'. These plans would make a great one story cabin with 384 or 840 sq.ft of space or a nice addition on to your home. Better yet this frame was designed to be an open shelter house by the pond for entertaining. The roof has a 9:12 pitch. the 20 x 42 has 4 bents and 3 bays. These plans would make a great space for a starter home or retreat into the mountains. With 552 sq. ft of space you have plenty of room to spread out and relax. 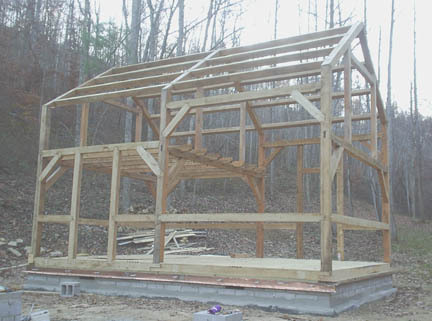 This frame would make a perfect great room for a hybrid home with a couple of stick built rooms added to the sides. The roof has a 9:12 pitch and the queen posts balance out the 3 bents of this great looking timber frame. These plans would make the ultimate woodworking shop. You would be the envy of every tool man around. The 12' x 16' room with a 9:12 roof pitch, could be enclosed and the shed portion can remain open or you could enclose the entire structure. There is even an option for a loft area in the main part of the timberframe. This frame was designed so that you could attach horizontal side boards to it. The frame has two 8' door openings, so that you can move your projects in and out easily. 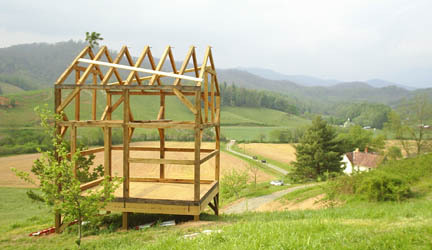 This is a timber frame Thoreau himself would be proud to cut. 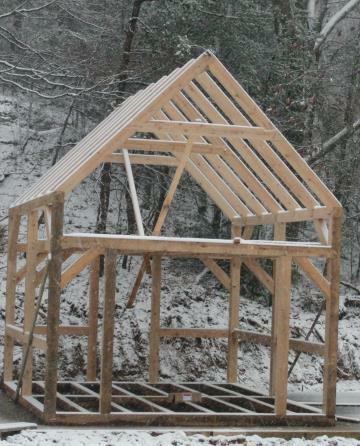 A simple timber frame can be the most beautiful. This timber frame with 336 sq. ft. could have variety of uses from your cabin in the woods, outdoor screened room, or with an 8' door option a small garage or workshop. 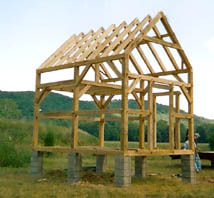 The timber frame has a 12:12 roof pitch which utilizes common rafters on 32" centers. These plans are similar to the Timberline with sheds attached on both sides. With 1128 sq. ft., this frame would make a comfortable size home. 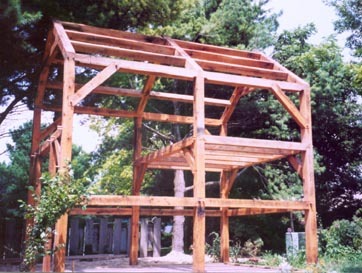 Purchase detailed building plans for this 12' x 16' timber frame to cut on your own. This frame has 12' walls and 4' walls in the 8' x 12' loft area, which gives you more headroom. The roof utilizes purlins to connect rafters which are at a 9:12 pitch. Plans include material list and detailed cut sheets for each timber piece. 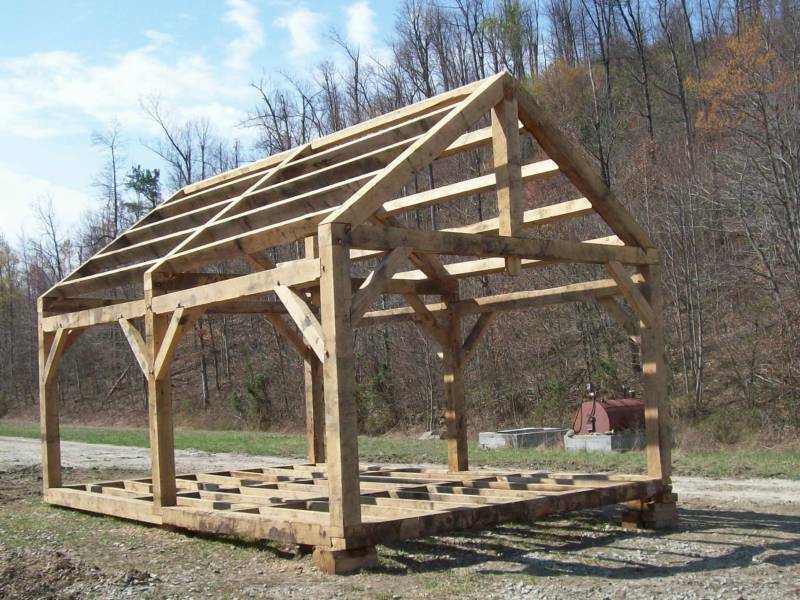 King Post Timber Frame Plans These plans would make a great picnic shelter or nice addition to your home. Three king post bents with a common rafter roof make this timber frame feel open even if you do decide to put walls around it. 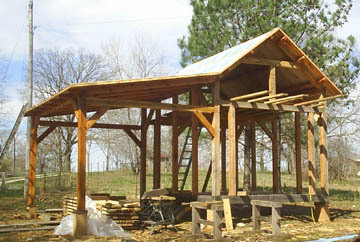 12' x 16' Timber Frame with an 8' x 12" Loft. These plans are close to the design of "The Little House in the Little Woods". The roof has a 12:12 pitch and can have rafters on 2' or 4' centers. 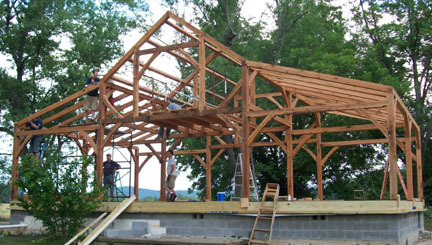 Sign Up for an Enjoyable one week Timber Framing Workshop! 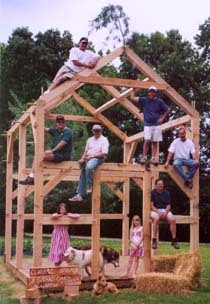 Learn how to build and raise a timber frame in the company of other timber frame enthusiasts! Spring and fall workshops are available to sign up for. Click here for the workshop dates available. "Great plans and quick shipping. Now I want to attend one of their classes"F.M. "Great set of plans from a great timber framer!" Therefore everyone who hears these words of mine and puts them into practice is like a wise man who built his house on the rock. The rains came down, the streams rose, and the winds blew and beat against the house; yet it did not fall, because it had its foundation on the rock. 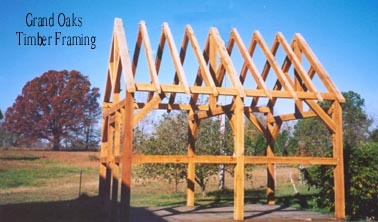 Great starter project to try your skills at timber framing. The joinery in this project is the same as a larger frame, just on a small scale. Even though I call this the Garden Shed, it could have many uses and will be the show case of your backyard! 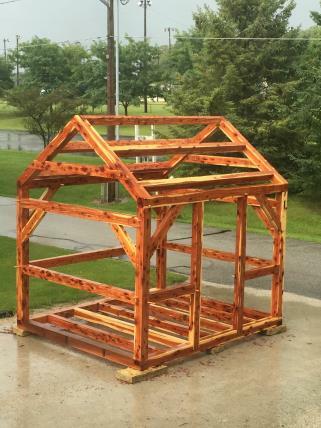 This frame has been cut from Eastern Red Cedar, which makes a really beautiful timber frame. 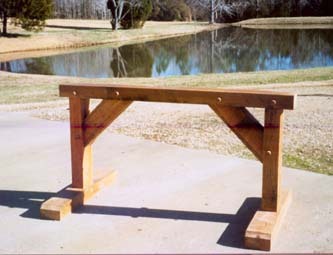 I did not cut this frame, but I did do all the design and joinery work for the customer. He cut and raised the frame himself. He had previously cut some of the other timber frame plans that I sell. This frame has a 40' x 24' foot print with a full 16' x 24' second floor. With 1344 square feet it would make a great barn or house. I have the full set of plans for sale for you to cut or Grand Oaks can cut it for you!